10. Tired of being rushed to the hospital in the trunk of a 1958 Buick. 9. 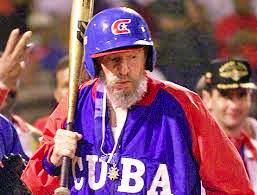 Finally realized that the rest of Cubans didn't know how to amass a $2 billion personal fortune like he did. 8. Tired of being accused of being a ZZ Top wanna-be. 7. Someone finally had the nerve to tell him that Army pants make his booty look huge. 6. No hope of ever fielding a world class long distance Olympic swimming team. 5. Average worker earns 20 dollars a month; anyone making $25 a month or over is considered a one percenter. 4. He no longer thinks that exploding cigars are funny. 2. Everything is free but the people. 1. Because it did fail. ¡Viva Cuba Libre!